The Spartacus HD Tire Carrier System provides the ultimate in strength and stability for mounting your oversized wheel and tire. Functionally designed to manage the amplified force and vibrations produced during extreme off-road conditions. The precision die-cast aluminum Hinge Casting provides maximum strength without the excess weight of steel. The one-piece design maintains one-handed access to cargo area and rigidly links the Wheel Mount to the reinforced section of the rear quarter panel. 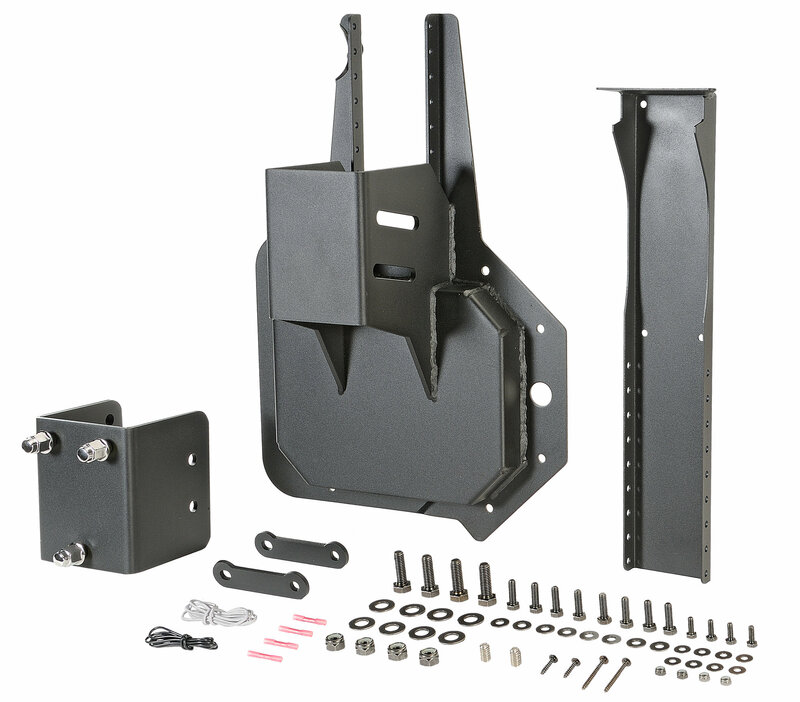 This, in combination with forged steel hinge brackets and hardened steel pins, results in far superior load capacity than the factory tailgate hinges, thereby effectively reducing wear and increasing longevity. The Wheel Mount lifts the mounting position and incorporates depth and tilt adjustability for large diameter and wide tire options. Tested to MIL-STD-810 to simulate extended duration of vigorous off-road driving conditions. Rated for up to and including 37 wheel tire combinations. Includes adjustable third brake light bracket. Compatible with OE and most aftermarket rear bumpers. No drilling required. Patent Pending. Made a huge difference to my jeep. I knew the stock hinges were weak but I never realized how much my 35" spare tire was bouncing around back there. Jeep rides quieter and smoother now. Great product and extremely well made. Feels like I could carry an elephant back there now. Don't risk ruining your tailgate with a heavy spare tire. Had another brand with a bumper mounted spare. Could not take the rattle any longer! 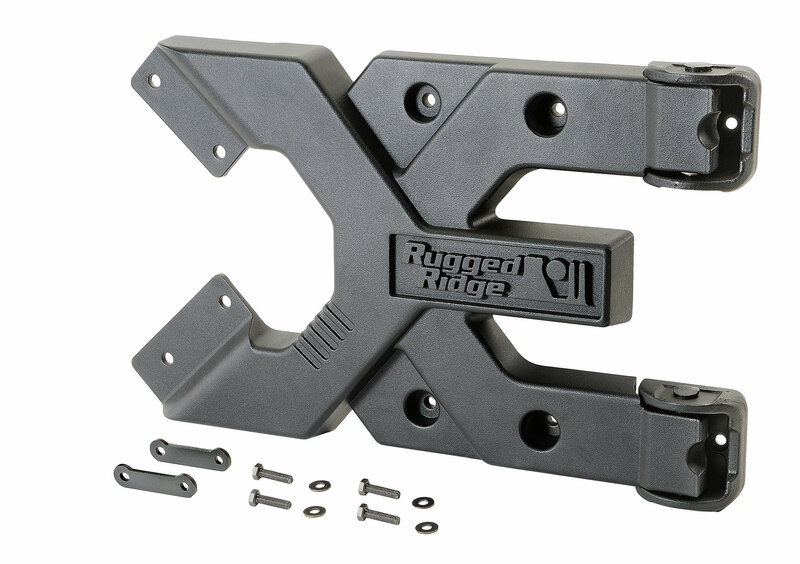 Ordered the Rugged Ridge HD mount and OMG! why did I not do this in the first place?!! A very solid piece of equipment and not a peep out of it. I could not be happier. Very easy install. Took around 2 hours to complete.